Imagine you’re in charge of a budget for a large organization of a few thousand people who are experts in their field. Imagine that if you don’t spend some of the money in the budget that you can’t keep what you’ve saved- it will be lost forever. Now imagine that there’s another group of a few thousand experts with exactly the same budget, right down the last penny. That’s the kind of scenario that we face at the LHC, except the budget is in time and not money. We count proton collisions and not dollars. The LHC is delivering world record luminosities right now, and the different experiments are getting as much data as they can. 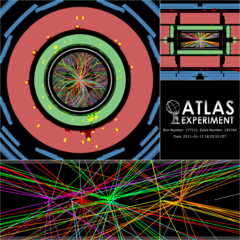 For LHCb and ALICE there is pressure to perform, but between ATLAS and CMS the competition is cut throat. They’re literally looking at the same protons and racing for the same discoveries. Any slight advantage one side can get in terms of data is crucial.